LED Neon Flex - Albuquerque Chooses Vivid RGB! 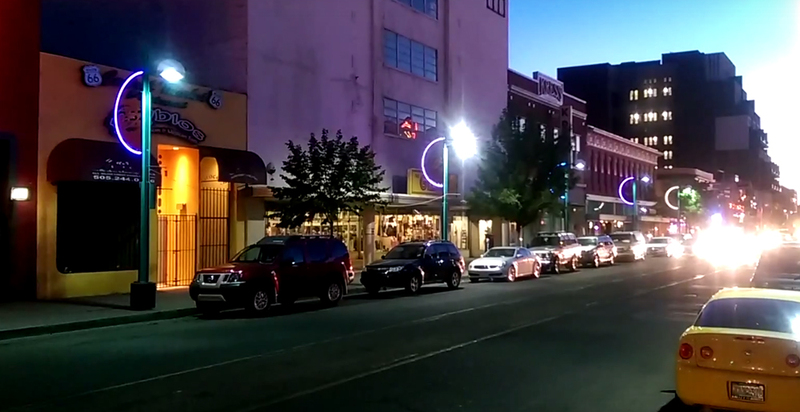 To help revitalize downtown Albuquerque, Vivid RGB energy-efficient LEDs are now lighting up Central Avenue from 3rd through 5th St. The goal of the project was to illuminate downtown with color-changing lights while celebrating the historic Route-66 legacy. The LED lighting designs are part of a group initiative by Downtown ABQ Mainstreet and PNM to bridge the iconic symbolism of our former (historic downtown) with the future and all of its possibilities (like new energy-efficient LED technologies). Vivid RGB complimented the other designs that use color-changing lights like those along Central and the railroad tracks, along with the Big-I, Nob-Hill and more. “We wanted the lights to change color for the holidays, too,” said Mary Collins, President of Downtown Albuquerque Mainstreet and Director of Strategic Initiatives within the Marketing and Communications Department of the Public Policy Group at PNM.